Our latest update introduces two new improvement tasks. Many of you have requested this feature via our board, so big thanks for your thoughts and insights. When keyword bids are below the first page estimate, ads often get little to no impressions. 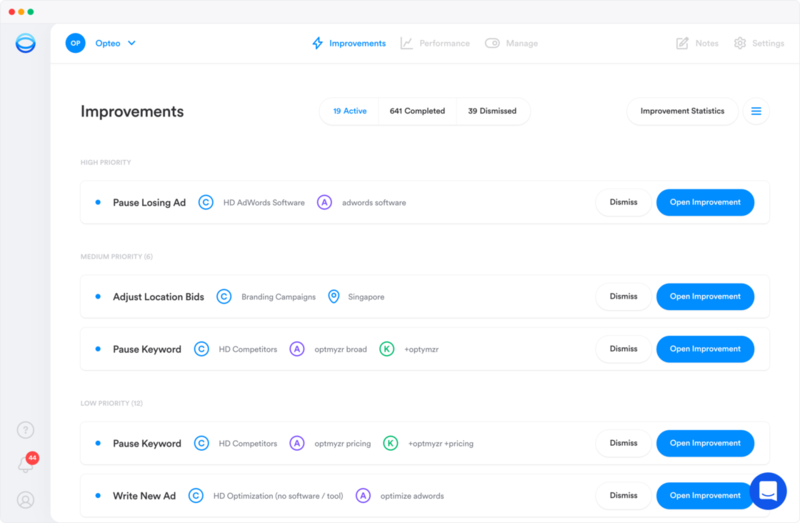 Opteo will now flag keywords with insufficient bids — then, taking your current bid and the estimated first page bid into account, Opteo will calculate a bid increase to get your ads showing again. Adding campaign-specific ad extensions can make your ads more relevant, often improving CTRs and increasing conversions. 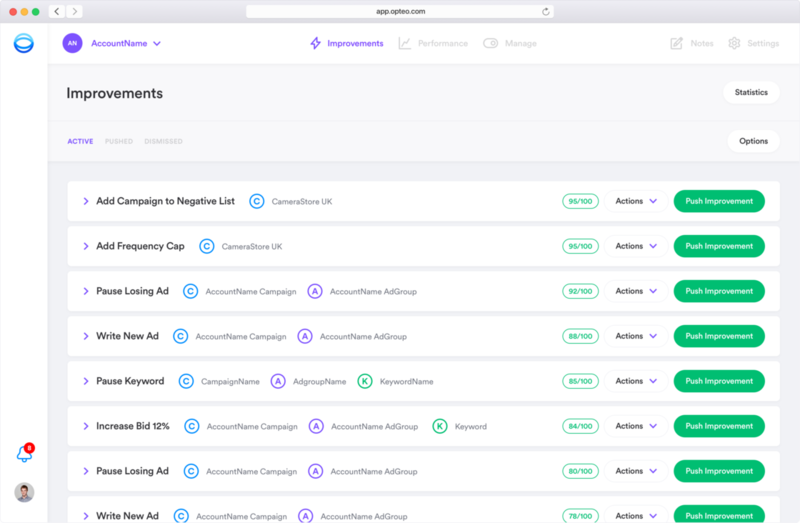 Opteo will check your highest-spending campaigns for campaign-level ad extensions. If we find any opportunities, Opteo will invite you to create and push extensions live, directly from the app. You can learn more about Fix Below First Page Bid or Add Extensions to Campaign in our help docs. We're always keen to hear your feedback, so let us know via the chat bubble inside the app or email support@opteo.com. Our latest release (1.0.0) introduced a number of significant changes. These changes helped to build a solid foundation for new features and future improvements to the Opteo ecosystem. We appreciate your help squashing any bugs we might have missed — things are looking stable and performance should continue to improve over the coming weeks. Listening to your feedback, it quickly became clear that the "Improvement Pushing" process needed to be quicker and more efficient. So we made the Improvement Queue, a quick way to push multiple improvements at once. (1) Select the Improvements you'd like to push. (2) Click the Push Improvement(s) button. (3) Watch as each Improvement is pushed to your Google Ads account. When pushing a single improvement, you can now set the confirmation window to close automatically on completion. This lets you quickly move back to your list of Active Improvements and on to your next task. In keeping with Google's latest changes, we've updated our in-app ad writer to include a third headline, second description, and 90 character limit for description text. You can choose to fill every field, or stick to two headlines and one description if you prefer. 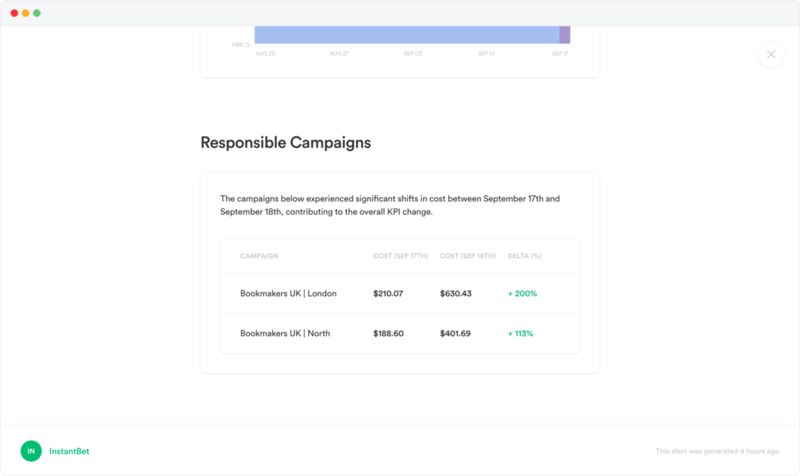 We're also excited to introduce Campaign Alerts. When overall performance appears stable, it can be difficult to stay on top of individual campaign performance. 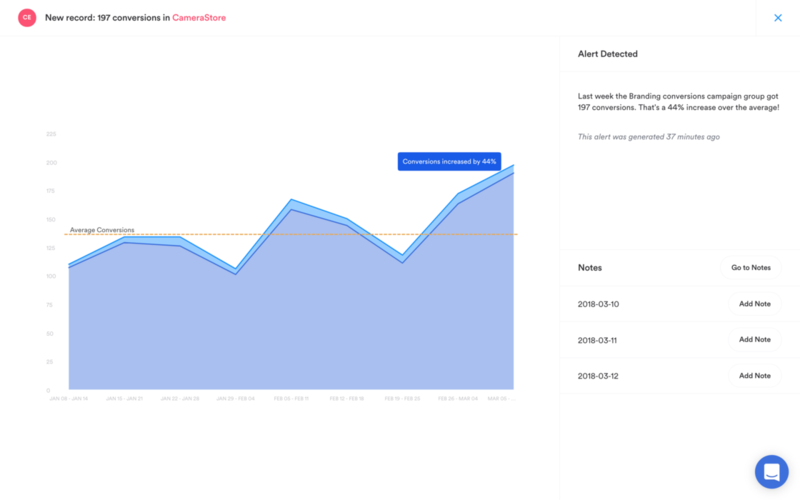 Opteo now alerts you to any major KPI fluctuations at the campaign level, so you can choose when to investigate further. We've added more detail to Account Alerts, highlighting which campaigns have contributed to any unexpected changes. This extra information should help you pinpoint the source of any performance issues. 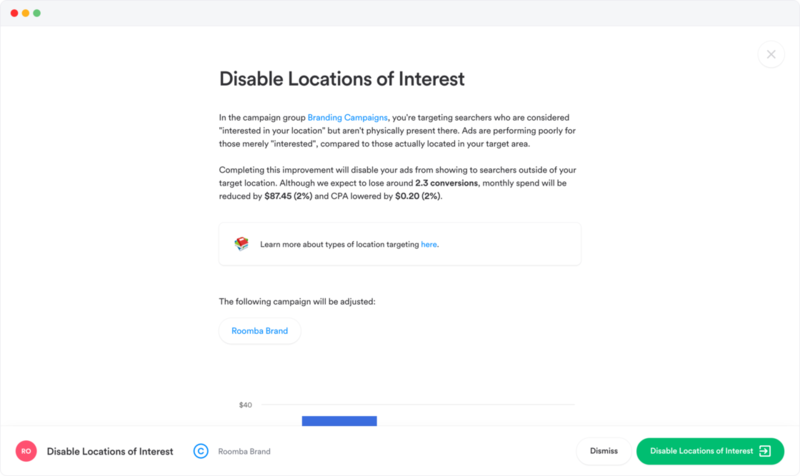 In addition to Improvement Queue and Campaign Alerts, we've added a new improvement type: Disable Locations of Interest. 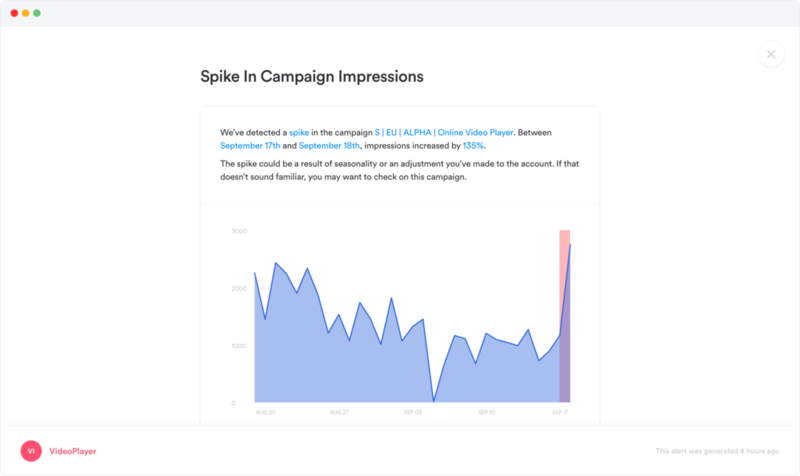 It compares the campaign costs of searchers interested in your target locations to searchers actually present in your target locations. 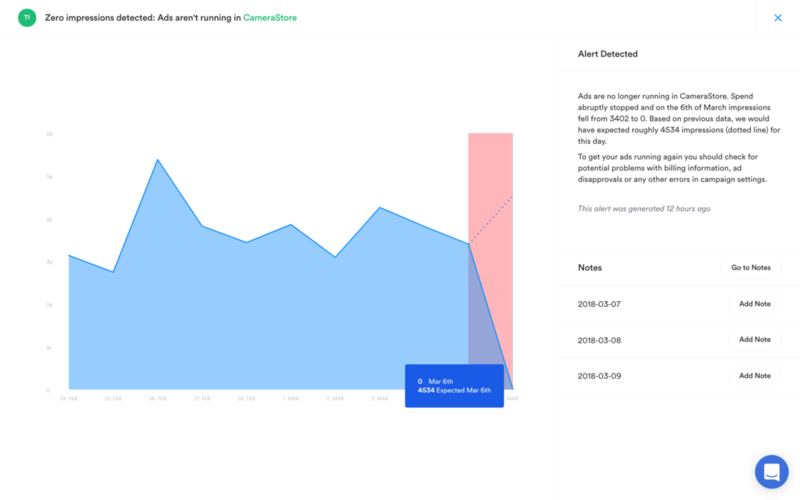 If performance is significantly worse for those merely interested in your target locations, Opteo will suggest disabling your ads for those searchers. Last but not least, a number of users asked for a feature to export their Notes for use outside of Opteo. Use the new Export Notes button on the Notes page to download a .CSV file containing all notes from the selected account. That's all for now! Please do send feedback our way using the chat bubble inside the app or via email to support@opteo.com. As always, we hope you find the new updates useful. Thanks for reading! This is a big update, so we’ve grouped changes by where they appear in the app. 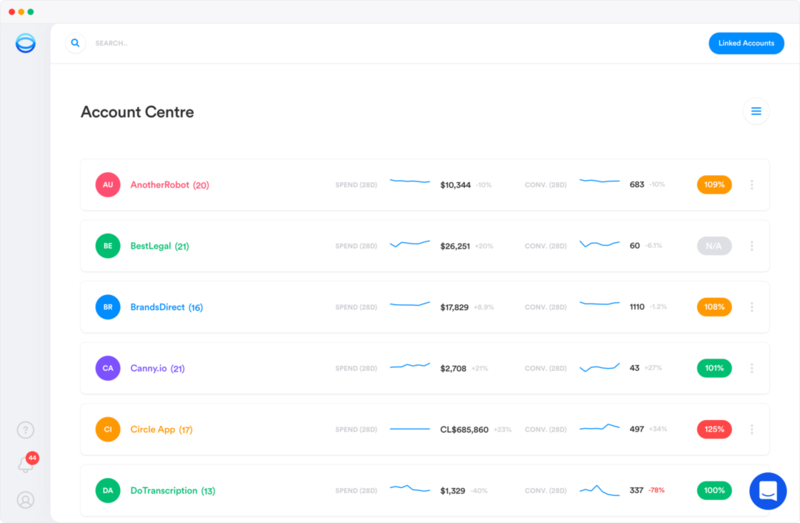 Scroll to find out about the new things you can do in Account Centre, Improvements, Performance, Manage, and a few other places! 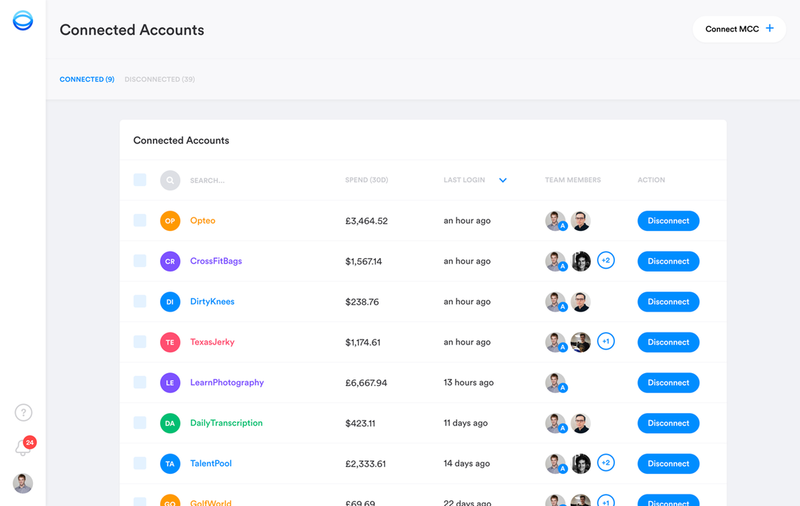 You can now view your accounts in either grid or list format. Switch back and forth with the Grid and List buttons in the Account Centre sidebar. We heard lots of users asking for more control over how Accounts are organised inside the app. 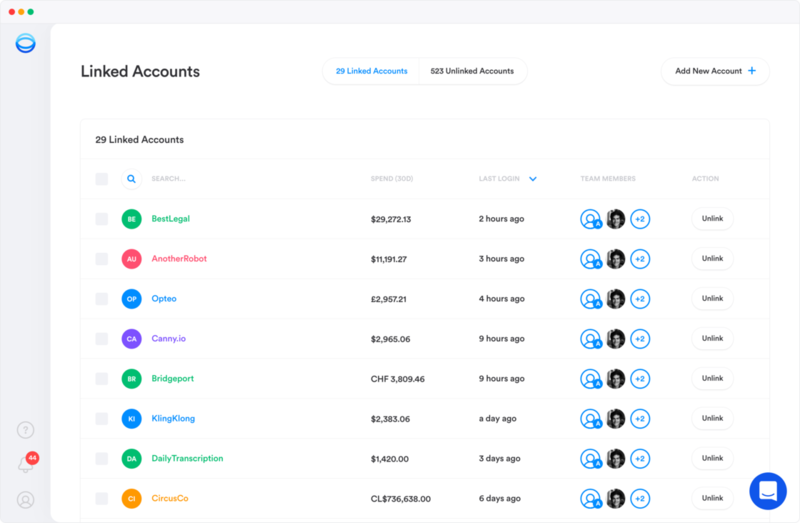 So, you can now sort your accounts by name, number of available improvements, or spend. Don’t see the account you need? Quickly access Linked Accounts right from the Account Centre, using the new Linked Accounts button. 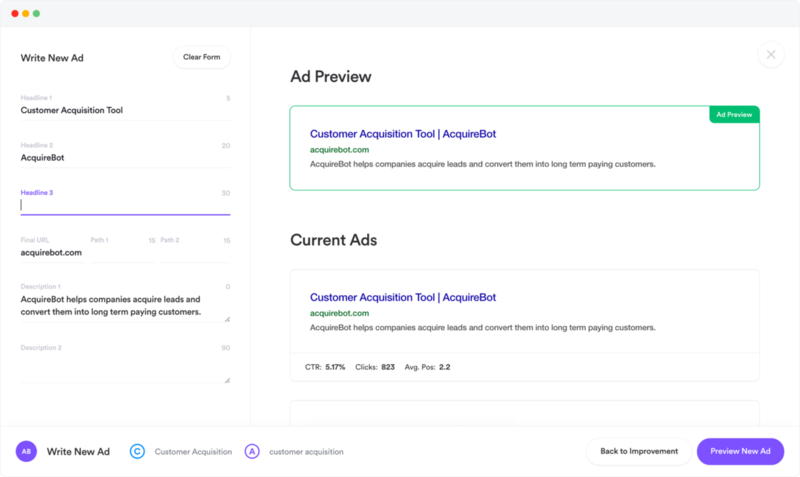 Introducing two new improvements — Adjust Locations Bids allows you to adapt bids to different geographic areas, while Add Negative Keyword to Shopping Campaign kicks off our support for Shopping campaigns. Improvement tasks now pop out on their own, distraction-free page, allowing you to focus on the task at hand. Active Improvements can now be sorted by priority, type, or date created. Plus, improvement types are alphabetised for easy scanning and filtering. Brand new Improvement Statistics shows you information about your completed improvements in the past week and over all-time. Useful for monitoring your activity over time. See Dismissed Improvements grouped by date, open each improvement to view details and data, and see when they're due to revert to active. New icons and colour schemes for Improvement buttons clearly indicate when and where Opteo will make a change to your AdWords account. We get a lot of export-related feature requests, so we’re excited to introduce the first of many export features to come, Export Scorecard. 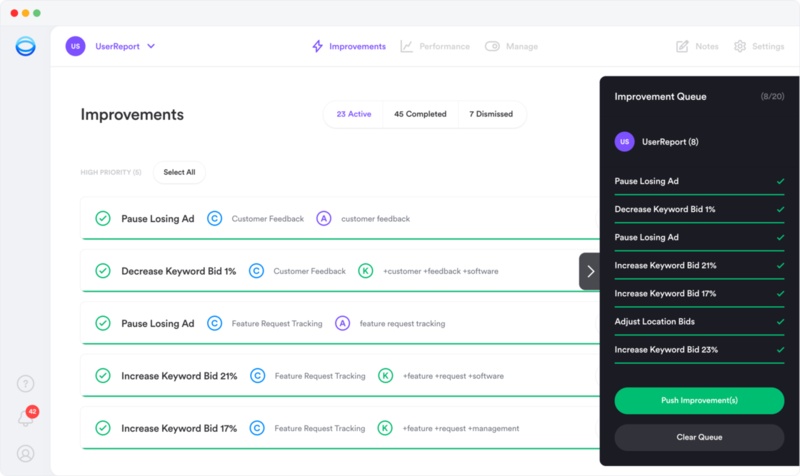 With this release, you can download an account's Scorecard as a neat .PDF file with clear, descriptive, client-facing copy. Brand your Scorecard with a company logo, and use the Filter button to choose which pages to feature in the final document. Type in dates directly or select from the calendar, go backwards, and use new Cancel & Apply buttons to firm your selections. We’ve removed graph annotations, making way for a big-time future update to Notes and Graphs… watch this space. Users with large accounts, you’ll find Scorecard now loads where it didn’t before. Sorry about that one — we hope you love it! More loading fixes and smoother scrolling for large accounts. Compare account stats at the campaign group level, with new power to collapse campaign groups. Under Campaign Groups, we’ve replaced the manual Save Changes button with an auto-save function, so your edits are always safe. When linking or unlinking accounts, hover over the spend of any account to see it converted into USD, for quick calculations. It’s our first step to providing an easier understanding of spend across your accounts. 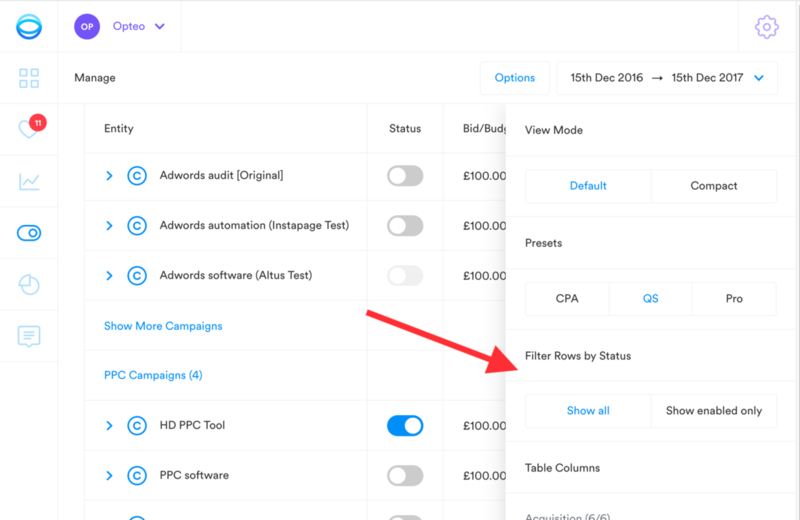 Take control of all invoices and their details in one place, with the new Invoice Settings button. Zero Impressions: If an account's impressions fall to zero, we'll email or Slack you so you can fix any potential payment issues or errors in a timely fashion. Connected Accounts shows you all of the AdWords accounts you have connected to Opteo. Making changes to this list is now much simpler. Connect and disconnect accounts individually or in bulk. Sort by AdWords spend, last login date and connected team members. Check which team members have access to which Adwords accounts. Click on the avatars to add or remove team members from each AdWords account (admins only). 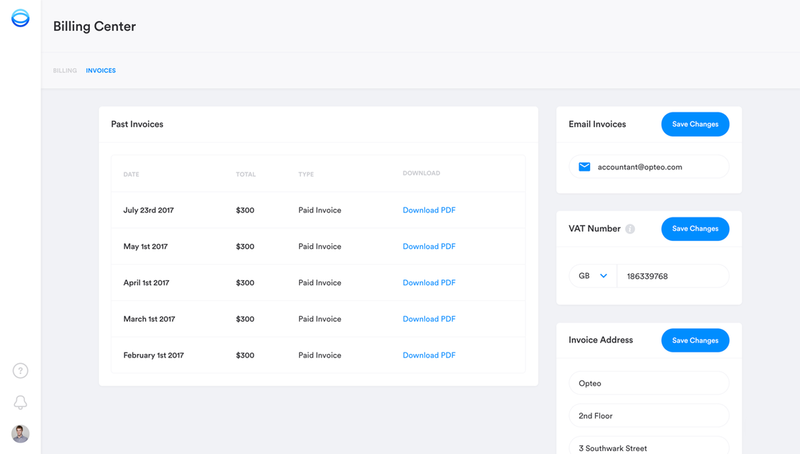 We just released a brand new Billing Centre for account admins -- a new home for all invoices and payment information. 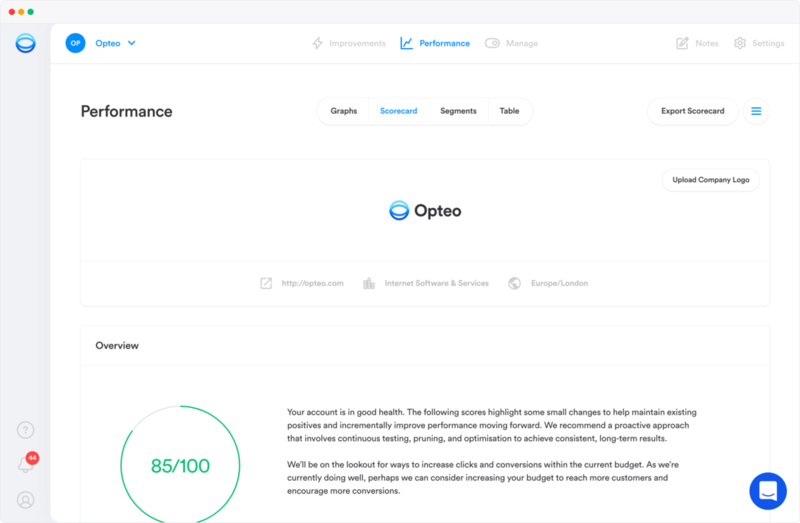 Opteo has a new look! We've updated the interface to make it easier to find and use the information you need. Each client now has their own menu bar at the top of the screen for Improvements, Performance, Manage and Notes. The Performance tab now includes Scorecard & Segments so you can see a full overview of your client’s account performance, all in one place. We've also made a couple of tweaks to the graphs in the Performance section: each graph now includes an at-a-glance data summary. 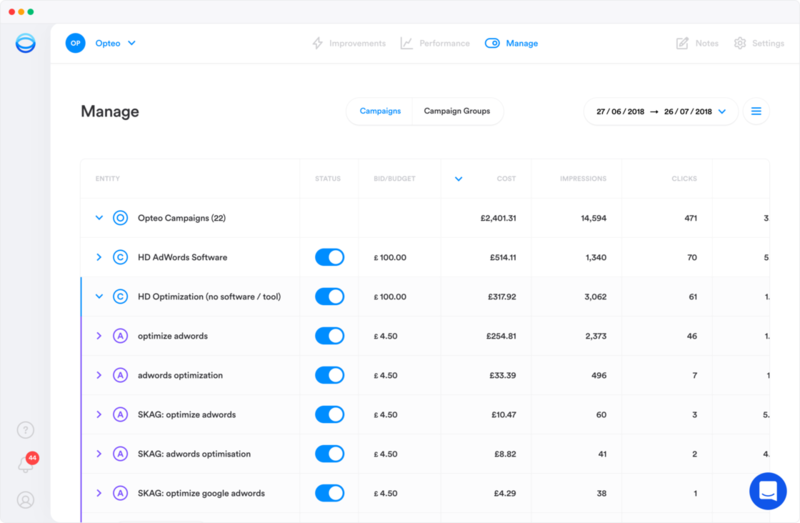 Finally, campaign groups can now be found under the Manage tab so you can categorise your campaigns in context. 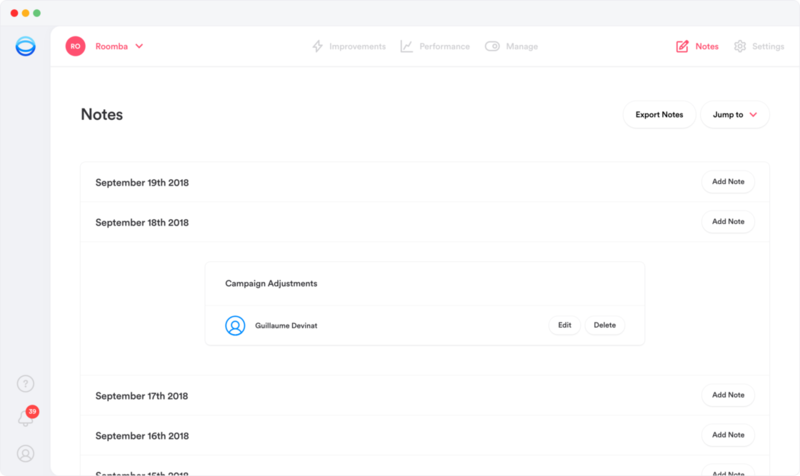 A common request in Manage has been to filter out paused and deleted entities (campaigns, adgroups, keywords, creative etc) to only look at enabled entities. You'll now find a new section in the "Options" sidebar of Manage called "Filter Rows by Status" where you can either show all entities or just enabled ones. "Show all" is useful when you want to understand how the account performed in a given time range in the past. Questions like "How much budget have we spent this month? ", "How many conversions did we get last week?" are easily answered using the "Show all" mode. "Show enabled only" will de-clutter the table and help you focus your attention on entities that are actively spending budget and impacting your account performance right now. Note that the "show enabled only" mode recalculates all of your stats from the keyword level, bubbling up. In this mode, a paused keyword won't contribute to the cost of its parent adgroup and campaign. This means that this mode is also helpful to estimate results moving forward. For example, if you just paused a bunch of poorly performing keywords, "show enabled only" can be a quick hack to simulate roughly how the account would have performed without those keywords. As AdWords accounts age and accumulate keywords, it's easy for mistakes to slip in. Occasionally, negative keywords accidentally block all of the search terms of certain keywords -- this creates "dead keywords" that don't get any impressions and crowd up your account. This improvement will scan AdWords for any keywords that are completely blocked by a negative, and will give you the opportunity to either remove the offending negative (if it was added by mistake) or to pause the blocked keywords (if the negative is warranted and the keywords are no longer relevant). That way, you'll either unblock the traffic or clean up your account. Regardless, you'll be left with a tighter account structure, which is always a win! Surely Opteo will start publishing changelogs very soon.